I don’t think I wanted to be born. At least not into a country that had just been devastated by a terrible war. Everything was rubble. And food, clothing and shelter was scarce. However, I had little choice in the matter. To soften the blow I was granted a bunch of wonderful fairy godmothers to guide and help me during this incarnation. Furthermore, my future earthly parents came from healthy farm stock. This guaranteed some basic comforts during these difficult times. But before I could make my reluctant entrance my future mother went through her own agony and pain. She and my father had been married only a year before. At that time my father was still a soldier. But now the war was over and like thousands of other men he had not come home. Was he still alive? Like so many other women she went through awful months of waiting and uncertainty. But one day she got news that my father was alive and well! He was a prisoner of war in an US prison camp in southern Germany. But -- like all other prisoners -- he was not allowed to see anybody or send or receive anything in writing. His time in the prison camp, he told me later, was not too bad. But it was terribly boring since they had nothing to do -- except to wait and pass the time. However, one day in September, my father was called into the office of the prison camp. The officer showed him a small parcel that had been addressed to my father. His heart leaped. But the officer took a knife and slowly opened the parcel in front of my father. He removed a card that bore the handwriting of my mother and tore it unread into many pieces before my father’s disbelieving eyes. Then the guard took out a small salami, a pipe and some tobacco. He carefully inspected all three items and then pushed them over to my father: ”Here, these are for you.” he said. Although my father was furious and hurt for not being allowed to read the card he decided to celebrate. When he returned to his quarters he cut the salami into seven slices and shared them with all those fellow prisoners who came from Bremen, like himself. Together they enjoyed this ‘lavish’ morsel. Then my father took the pipe and filled it with tobacco. He tried to light it, but to his surprise he could not draw any air through the pipe. He tried again and again, but something was blocking the pipe. My exact time of arrival on this earth was 3.45 am -- for anybody interested in horoscopes. And the year was l945 -- the year of the Rooster in the Chinese calendar! Much, much later when I began to study horoscopes I learned -- from a placemat in a Chinese restaurant -- that Roosters are colorful, opinionated and entertaining. They love to travel, hate boredom, know the ups and downs of life and are tellers of many tales. But none of this had any meaning to me when I was born. I was ugly and wrinkled, like all other babies. But my mother was happy, relieved and 8 lbs lighter. As I got a bit older, my overall appearance improved. But I still had problems adjusting to my new life on Earth. I vividly remember how often I felt powerless as a child. I was powerless against the many forces around me as well as the feelings and emotions within me. I rarely knew why I had them or how to deal with them. I also didn’t know how to express them or to whom. At that time I didn’t know that everybody else was probably feeling the same way. Being afraid of rejection or of being laughed at, we didn’t share our feelings but kept them to ourselves, particularly we boys. Only many years later, when I was a grown-up and felt safe, could I reveal these feelings and fears for the first time in my book A COOL KID LIKE ME. Although these feelings and emotions haunted me during my early childhood I was not totally lost. Heaven had kept its promise and given me a great fairy godmother. She was already waiting for me as my grandmother “Oma” who lived with us and kept a constant eye on me (and my mischief). She was the most wonderful soul I have ever met. In all the years I knew her, I had never seen her angry or hear her raised her voice. She ran everything in her quiet, loving way, never demanding anything for herself. Her presence was my security, my safe haven, my island in the stormy sea of childhood. The other fairy godmother was my aunt Hedwig who owned a printing shop. During the years after the Second World War everything was scarce in Germany. Paper particularly was handled by many as a luxury item. But my aunt had plenty of it -- whole shelves full of stacks of paper in all colors and sizes. I could get as much as I wanted, because my aunt was very eager to support the budding artist in me. These sheets of paper -- which often still had the delicious scent of the printing shop -- were pieces of heaven to me because I could draw and draw to my heart’s content. This was one area in which I could experience total power and I had no restrictions. Here I could express my emotions, my dreams, my hopes, fears and fantasies. Nobody could tell me how my pictures should look because nobody saw them as I did. Drawing became my way of dealing with the difficult process of growing up. At the time though I didn’t see it that way. I only did it because it was fun. And today I still use that fun as a favorite way to deal with the bumps of my life. I think my childhood was pretty average. I had one brother and one sister who were older than me and who came from my father’s first marriage. And I also had one younger brother. The problem was that we were each five years apart from each other. Therefore, we never really were play mates during our childhood. But we became closer as we got older. I grew up in Oberneuland, a small village on the outskirts of Bremen. The community was a mixture of many farms and stately summer residences of wealthy city people. Little did I know how privileged I was to grow up in such wonderful environment. Our house stood in a lovely park with many old oak and chestnut trees. Behind the house was a big pond with all kinds of fish and wild life. And behind the pond was a huge vegetable garden with several apple, plum and pear trees. The park and the garden was surrounded by a forest in which I had to climb every possible (and impossible) tree. I loved to build secret houses in treetops, under bushes or even underground. I could not have picked a better place to grow up with so much space to roam and play. But living in the countryside where the houses were far apart from each other I didn’t have too many friends and was alone a lot. At that time mothers did not drive their kids from place to place and activity to activity. We either walked or took our bike. So, I spent much of my time drawing. And I even read a little -- but not too much. Mostly I read Mickey Mouse. I loved these magazines and books not only because I thought they were fun but also because my parents didn’t approve of them. They thought that anything with speech-balloons could not have any redeeming value for their tender, highly impressionable child. I couldn’t get enough of them. They were full of adventure and excitement. I particularly loved the way grown-ups were portrayed as silly or goofy. What a release! Besides these stories gave me my first intriguing glimpses of the American way of life, which I found fascinating. I thought everything was more colorful and joyful in America. For instance, I loved the way Americans put wreaths on their doors at Christmas -- so much more sensible and picturesque than using them only for funerals, as we did in Germany. As I grew a little older my favorite reading material changed from Mickey Mouse and Donald Duck to more dramatic stuff like Prince Valiant by Harold R. Foster. What stories, what pictures! Even today I still feel that these adventures were some of the best written, paced and illustrated stories of our time. Thank you, Harold R. Foster! Thank you, Walt Disney! I learned more about good story telling from you two than from any other source. But getting back to early childhood: One thing I found rather frustrating was the fact that we didn’t have TV. In the opinion of my parents and their friends, TV was only for the poor and less educated people who needed a “baby sitter” or were unable or unwilling to entertain themselves. It was a status symbol not to have a TV (unfortunately that changed over the years). This total lack of electronic distractions forced me to create my own activities, games, worlds and universes. I did this largely in my drawings and later in small stories that were my first little books. As I now see it, having no TV had been a blessing in disguise. It protected my creativity. As a matter of fact, I have never in all my life owned a TV. When I later lived in South Africa the country did not have TV for political reasons, and when I came to America I flipped the channels a few times and saw that I could very well do without it. I have to make the startling confession that I actually enjoyed school -- most of the time. In those days it was still okay to get good marks. You were not ridiculed as a nerd. On the contrary, you were actually liked, as long as you allowed others to copy from you. Copying each others’ homework was as common on tests. I did both with great success because there were subjects like algebra and French to which I was allergic. To make their point our teachers even used corporal punishment -- with the full blessings of our parents. For instance, I remember during my first year at school we had a lot of refugees in Bremen who came from many parts of Eastern Europe. One day the teacher asked everybody where they were born. I was so impressed by all the strange and mysterious names of places the kids mentioned that I was convinced they made them up. Desperately, I was trying to think of a place that would top them all. And when finally my turn came, I proudly stood up and said that I was born in America! 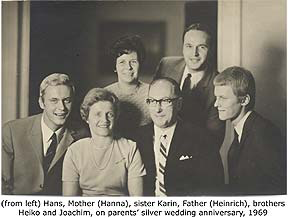 Unfortunately my teacher, Herr Stock, knew my family pretty well and rewarded my creative invention with a good smack! I learned from this little episode that making up stories is not an easy matter. The difference between being a fool and a good storyteller is skill, lots of hard work and a good knowledge of your audience. I was always one of the tallest kids in class. Skinny, with a very long neck and the usual lack of self-confidence, I thought I looked hideous -- and I probably did. But my size prevented me from getting into many fights. Very few kids ever challenged me physically. That was a relief because I was a total chicken when it came to physical confrontation. I strongly disliked sports -- particularly where you had to run after a stupid ball and follow orders and rules which made no sense to me at all -- in which the goal was beating the others. Somehow, I thought this was dumb, because the loser always hates the winner. And when you are young with little self-confidence you don’t want others to hate you. It’s bad enough that you are hypercritical of yourself. Who needs others to dislike you when you can do that very nicely by yourself! As you might expect the one subject I was really good in was art. Very often, when we were asked to write a report on our vacation or some similar boring subject I simply drew it. By using very few words I substantially reduced the likelihood of spelling mistakes. These first little “books” of mine were a great hit and all the teachers loved them, which reflected rather positively in my report cards. But these were not the only books I made. In my early teens I wrote and illustrated several stories, bound them into little books and sent them off to publishers. Deep in my heart I knew they were not as great and wonderful as the ones in the book shop, but I hoped that the publisher would give me some advice on how to improve them. Instead I always got them back with a pre-printed rejection slip. That was both frustrating and discouraging. Having never met a real life author or illustrator and coming from a totally non-artistic family, I was completely lost and alone with my problem. I eventually gave up making books and sending them out. I still hoped to use my talents one day and thought about becoming a graphic designer. But when the time came to make a career choice, Germany had a glut of graphic designers -- and many of them were out of work. This put a real damper on my aspirations. Although I grew up in postwar Germany, I personally was not used to scarcities and sacrifices, which an artist’s life may entail. On the contrary, I was used to a certain amount of abundance and the good life that my parents provided for us. And now I had to make a very difficult choice: Was I ready and willing to follow my ‘bliss’ and become an artist, whether or not it would provide me with a reasonable income? Of course, I chickened out. I didn’t become an artist -- at least not right away! Taking the well meaning advice of my father who was a banker, I embarked upon a sound business career that included colleges and a commercial apprenticeship. But I didn’t fully ignore my talents -- I also took art classes in the evenings. Today I very much appreciate having had both educations. In the business world I learned a lot of things that were not taught in art classes. To some degree, I learned self confidence, skills of negotiation and always to read the small print! I learned to dress properly and not to be scared at cocktail parties. As trivial as these tools may seem, they proved to be most beneficial many years later when I had to deal with publishers. I was no stranger to rejections, contract negotiations and promotional campaigns. I understood that publishers are profit-oriented business enterprises that have to follow strict rules to survive and prosper. And if the artist is a dependable and conscientious partner with some understanding of business dynamics, he can greatly contribute to the success of a book. Those years at college and apprenticeship were pretty dull. This mood was enhanced by the eternally gray sky over Bremen. If it wasn’t raining week after week it was at least overcast or very windy -- or everything together. Blue skies and warm sunshine were as rare as Easter bunnies at Christmas. I became increasingly aware of how my psyche was affected by the weather. The moment it was warm and pleasant outside I underwent a metamorphosis and became a truly nice person! Why couldn’t I always be like this, I wondered. And, slowly, a fascinating idea took root in my adolescent mind. I had just turned l9 when I firmly made up my mind as to what I wanted to do after college and apprenticeship were over. I didn’t tell anybody my plan --not even my parents. Weeks before Christmas I asked them not to buy me any presents. I only had one big wish, which I would tell them on Christmas Eve. This raised a few eyebrows, since it was unusual for me to turn down any loot! There was no objection or opposition to my plan, with the exception of some tears and sighs from my mother. Whether or not my parents truly had the confidence and trust in me to let me go to a strange country where I didn’t know a single soul, I shall never know. All that mattered was that they gave me their full support, for which I am still grateful today. Every bird has to leave the nest and learn to fly. Now my turn had come and I was more than eager to spread my wings! The first time I truly fell deeply in love was not with a person, but with an entire country! That was South Africa with all its wonders: the different races, the many colorful cultures, the incredible countryside with vast deserts, endless lonely beaches, lush mountains, gigantic canyons and a wild bushveld full of lions, elephants, rhinos, giraffes, zebras and a million other creatures. And all covered by a blue sky and bathed in what seemed an eternal sunshine. How could anybody not love such a place! Here I experienced a sense of freedom and zest for life that I never thought possible. My inner contentment and happiness deeply affected my way of interacting with others, and it was no wonder that I encountered only warm, friendly and helpful people wherever I went. In no time I had a job and a nice place to live. In the beginning I shared a house with several other young people who had come, like me, to live and work in South Africa. Our free time was filled with horseback riding, tennis, safaris, desert trips and lots of parties. We never missed an opportunity to get together, to talk, gossip, dance and share some cheap wine together because we couldn’t afford the expensive one. It seemed that the warm evenings under the starry skies were a long row of parties, balls and weddings where people fell in and out of love faster than the change of the seasons. Yes, in a way these first years were very carefree, self-centered and perhaps superficial. But they added a delightful texture to the ups and downs of someone who is born in the year of the Rooster. The focus changed, however, when I rented a charming thatched cottage in a more desirable part of Johannesburg. The cottage was part of an estate owned by Ben and Leone Itzigsohn, who with their four children, immediately welcomed and adopted me as a new member of their wonderful family. With their genuine warmth, gentleness and generosity they gave me a place I could truly call home. And with it came an enormous circle of friends and relatives with Sabbaths, Bar Mitzvahs, Passovers and many other celebrations. Many of their friends were in strong opposition to the apartheid government at that time. They were also politically active and took me to several of their meetings. These gatherings had a very deep effect on me as they echoed my own growing distaste for the brutality of the South African government. My attention and lifestyle -- which until then was very self-centered and self-absorbed -- underwent a shift, and I began to see the incredible complexity, diversity and division of this country with new eyes. Although my years with the Itzigsohn family were full of deep and rich moments, I eventually felt the time had come to for me to have my own place. I found a small farm just halfway between Johannesburg and Pretoria, the capital of South Africa. It was a lovely place, surrounded by huge pine trees. On the white entrance gate was in golden letters written ‘Juergens Holz’ in memory of the place I grew up in Bremen -- which was named after my mother’s family and “Holz” meaning: woods. The long driveway, flanked by flowering jacaranda trees, lead to a white house nestled under huge acacia and eucalyptus trees and surrounded by oleander and rose bushes. In my mind I can still smell the sweet fragrance of the flowers and hear the humming and buzzing of the insects. To me this farm was a small paradise where I spent some of the happiest years of my life. On countless occasions I felt overcome by deep, deep joy and gratefulness. These deep emotions of appreciation for the many blessings in my life were continuously evoked by some volunteer work I did at Lifeline, a telephone crisis counseling service in Johannesburg. I don’t know if I have ever really helped anybody during these years as a counselor, but I do know that this work helped me tremendously. Being drawn into the crises of other people can be very exhausting and challenging, but it certainly puts a damper on any crying or whining about one’s own little miseries. And yes, there were also bumps in my colorful existence. No life is pain-free, and neither was mine. I later realized that all the emotional pain I ever had came from unfulfilled expectations. And these expectations were always caused by me. Therefore, the creator of my own pain was always me and nobody else. But at that time I didn’t understand these dynamics. Undergoing my own suffering may have made me a better and more compassionate counselor, but it also forced me to ask some very vital questions, such as “What is life all about?” “Why are we here?” “Where do we come from and where do we go to?”. I had never seriously asked these big questions before. But now they became burning issues and more important than anything else. Little did I know that this was the beginning of the most important journey I ever undertook in my life: the discovery of who I really was and the purpose of my earthly existence. Today I see this emergence into the spiritual realm of life like diving into a vast ocean that surrounds a tiny island. Most of us live quite happily and content on the little island and have little desire to explore the sea. All we see is its blue surface. Few go further than knee-deep into the water where they circle a few times and quickly return to the safe shore. But those few who dare to dive and snorkel in these waters know the incredible beauty and variety of this world. And those who go deep sea diving experience so much more! They encounter new realities with many levels and dimensions. Like many others, I began my spiritual journey at the churches, but soon I had to go much further and deeper. It was the commencement of a study and a new way of life in which I am still strongly involved. It also resulted in many books for children and adults on spiritual subjects, which I wrote and illustrated many years later. It all began on my farm in Africa. But my usual weekdays were far more mundane: For over l0 years I worked as a sales manager for a well known brand of magnetic tapes. I enjoyed my occupation as it gave me ample opportunities to travel, lots of freedom and good pay. I also continued taking lessons in painting with well known South African artists like Lionel Abrahams and Andre Naude. I found a tremendous freedom and excitement in painting on large canvasses, particularly when we painted them outside in the warm sunlight. I also acted in the German Theater, which was very popular among the 80.000 Germans who lived in and around Johannesburg -- after all, there was no television at that time. For some reason, I was often picked for leading roles, but I was never really bitten by the acting bug. I could never share the great fascination of saying the same words night after night. For me rehearsals and intermissions were far more fun and exciting than the actual performance. I loved the team spirit, the glasses of champagne in the dressing room and the high spirited camaraderie among the actors. That meant more to me than the applause. Working, playing and acting with so many different people led to some remarkable friendships. One of them was with another young German. We both were artists at heart but working in a business environment. My friend did not accept this situation as well as I did and he was going to do something about it. One evening he invited me to his home. After a sumptuous meal he took me to his studio were he carefully opened a huge brown portfolio. It contained some of the most beautiful illustrations I had ever seen. They were full of joy and a celebration of mastery and creativity. “These are my illustrations for some children’s books I wrote,” he said. “In October I’m flying to Frankfurt to try to sell them at the International Book Fair.” I was very impressed by his aplomb. But I was even more surprised by how excited I was about his plan. It was as if these drawings had reignited a smoldering fire in me: my own repressed childhood dream of becoming an author and illustrator of children’s books! Was it possible that such a dream could still come true? It sure was for my friend! Not only did he sell all his books at the Fair, but within a few years he became one of the most celebrated children’s authors/illustrators in Germany and a nominee for the prestigious Hans Christian Andersen Prize. His name is Helme Heine. At the time when Helme first showed me his illustrations we were acting together in a political cabaret. It was a satirical cabaret in the old German tradition and our group was called SAUERKRAUT. The very witty scripts, songs and sketches were written by Helme’s brother Ernst Heine, who was also part of our acting team, together with Kiki von Radowitz who later became Helme’s wife. All four of us would in our very own way one day become highly successful writers. In SAUERKRAUT we delivered hard punches at anything and at anybody -- particularly the South African apartheid system. Our shows became so popular that they were often sold out in advance. We even became known abroad. One day a TV crew from German Television arrived to film our entire show. As flattering as such recognition may seem, it was not without danger. As severe critics of the South African Government policy we were now getting far too much attention. When one of us was investigated by BOSS (Bureau of State Security), we knew we had stretched to the limit and could not go any further. We had reached the point where we were likely to be thrown out of the country. The situation in South Africa was getting more and more critical. The overall political attitude seemed to be hardening every day. Many people who had made South Africa their home were now leaving. It was difficult to imagine a peaceful future or solution to the problem. The number of riots in the black townships increased, and were always beaten down by brutal police force. Every attempt at conciliation was crushed. Like most of my friends, I also made preparation to leave the country. It was an extremely painful decision, and where would I go? BASF, the company I was working for wanted me to join their German head office. But I could not imagine myself returning to a country of gray skies and short summers. What were my options? I got myself a big atlas and searched for places that would be beautiful alternative places to live. Naturally, no place could compare with South Africa, but I was prepared to make sacrifices. I decided to explore all the romantic sounding places very carefully by living and maybe even working there for a while. I had saved enough funds and there was no need to rush this trip. I vividly remember the day when I stuck price tags on all the antiques and other items that I had so carefully collected over the years. Everything had to go. I was determined to leave this country the same way that I came to it 12 years before -- with just one suitcase. It was one of the happiest days of my life when people bought and carried off all the stuff that was once so dear to me. For years I had wasted countless hours worrying about losing these precious possessions through fire or burglary. Of course, nothing ever happened. All I had really lost was the time I spent worrying! Friends who knew the great care with which I had once collected all the stuff could not understand the reason for my tremendous joy on that day. They didn’t know that I never really possessed these things -- they had possessed me! And now I was going to be free! I felt relieved and overjoyed. Into my diary I entered a firm pledge never to allow myself to be owned by possessions again. In March l977 I boarded the steamer “Galileo Galilee” in Durban harbor and left South Africa in a search for a new place I could call home. I had no idea that this pursuit would span over several years and take me across many continents. From Australia I went to Indonesia, Singapore, Thailand, Malaysia, the Philippines, Papua New Guinea, Fiji, Tonga, Tahiti, the USA, Mexico, Spain and England. I lived in some places for a long time, like in Bali, where I rented a beautiful small cottage on a mountain top near Ubud. It was a very mystical place and stirred my interest in this colorful, unique culture. In Bali I began to read and collect old folk tales and stories. One of them, “The Moon of Penang” was later published in Europe where it was turned into an animated TV show. I could write a lot about the many adventures I had during these times of living and traveling to exotic places. However, as fascinating as it may sound to encounter all these many strange cultures and environments, it was not without peril. Reading through my diaries, I am reminded that there were also times when my spirits were low. Not being fully integrated into the environment or taking a real part in the lives of the people living there, I often felt a lack of purpose that lead to self-doubt and a feeling of emptiness. Without my spiritual preparations I doubt that I would have been able to survive this constant uprootedness for such a long time. But looking back, it was a rich experience for which I am very grateful. It certainly cured me of my travel bug for the rest of my entire life. For a very long time after this trip I didn’t want ever to visit another church, temple, museum or see another obelisk or monument! I had really overdone it. One day, when I was living in London, I made a big colorful birthday card for a dear friend of mine. He was born in the Year of the Horse and I draw several very whimsical cartoons that made fun of the various characteristics of anybody born in the Year of the Horse. This birthday card was a terrific hit at his birthday party, and it lead to the idea of creating a whole book with cartoons of all the l2 signs of the Chinese Horoscope. When my book was finished I did something every publisher hates: I made a multiple submission. I sent out approximately 50 proposals to 50 different publishers -- hoping that one of them might be interested in this unique idea. To my utter amazement I received 24 replies from interested publishers who asked me to show them my material. After I had completed my rounds and saw each and every one, I had a total of l2 firm offers in my pocket! I was so high on myself -- I thought that I was the greatest gift to the literary world as my head couldn’t fit through any normal size door! I signed up with PAN BOOKS who offered me a good contract and promised the widest distribution. The book appeared in l980. It was my first published book and was a great success. Having the erroneous belief that getting published is the easiest thing in the world, I decided to “conquer” the American market. I took my book and left England for New York. As I didn’t know the first thing about US publishers I started my search alphabetically. Once again, for some mysterious reason, I did not have to struggle for long because the first publisher I saw was AVON BOOKS who made me an offer I could not refuse. Knowing today how extremely difficult it is to enter the publishing world, I am still amazed at my initial success. Partly it was a question of timing. I had the right book idea and saw the right editor at the right time. And it also helped me that I was very ignorant about the publishing field -- otherwise I would probably not have been so gutsy and bold. Sometimes it helps not knowing all the pitfalls, dangers and obstacles of a certain path beforehand. It was not my first visit to New York. I had been there a few times before. But this time I liked it so much that I decided to stay in America. At the beginning I rented a lovely beach house in Fairfield, Connecticut, which was only about an hour away from New York City. My large studio window faced the water. It was a spectacular view -- constantly being changed by wind, weather and tides. This was the beginning of my new and very challenging career as an illustrator and author. Since I had never had any specific training in this field, I began to read and study voraciously books by other authors in the same field. I wrote to several children’s book authors/illustrators whose work I really liked and admired. Out of this correspondence some close friendships developed over the years. But most of the credit for my schooling and training must go to my editors, in particular Janet Schulman of Random House. She showed me how to pace and develop a story. One of my favorite books we both worked on together was “I’LL ALWAYS LOVE YOU,” which is a true story about the death of my dog Elfie. Janet liked my manuscript proposal right from the beginning -- but it needed a lot of editing. However, when it was finally finished, Janet was not able to convince the sales department of Random House to market this book. At that time Random House had a very specific image in the children’s book market, and the sales department didn’t think that death as a subject would fit that image. Janet was as disappointed as I was about this unexpected decision. Luckily, I shared my frustration with my friend Maurice Sendak. He had just published his latest book with Crown Publishers, and it was a huge success. Being very satisfied with the publisher, he referred me to his editor at Crown. A few days later they bought my book without a moment’s hesitation. This book was my first real breakthrough in the children’s book market -- in America as well as abroad. My other “shaggy dog story” is about Waldo, who entered my life rather discreetly but was to have a major impact on it. It all began when I took a careful look at the typical childhood in America. I was struck by the fact that 50 % of all children lose one of their parents -- usually the father -- through divorce. Furthermore, the average term of house ownership is seven years. That means that many children not only lose a parent, but also lose their best friends by having to move away. And when their grandparents get “shipped” to Florida, they lose again. With little opportunity for young people to form lasting, trusting relationships, I don’t think it is very surprising that psychiatry or drugs are so popular in this country. In my book “A New Home - A New Friend,” the little boy Michael is moving to a new place and longs for a new friend who is like a best friend, a father and a grandfather. His needs are answered by the world’s most wonderful, wise, loving, shaggy and huggable dog -- called Waldo. The book was not meant to become a series, but the appeal of this dog eventually led to more than 50 different books, book clubs, calendars and even a TV show. You can’t keep a good guy down -- particularly when he has a bushy wagging tail! After my initial years in a rented place at the Fairfield beach, I wanted to have my own home again. After a long search I found a lovely house in Westport, Connecticut. It has a large studio that overlooks a beautiful garden with many huge old trees, rhododendrons and azalea bushes. On one side there is a large and overgrown pond, which looks like a perfect home for the Swamp monster. It is, however, also the gathering place for deer, raccoons, foxes, skunks, squirrels, fishers, muskrats, snapper turtles and a large variety of birds. As animated and diverse as this scenery is, I still had problems getting used to working alone all by myself. In my past position as a sales manger, I had twenty people to work with; in the theater I was just one of the team. But now I had to learn to spend a great deal of time all by myself. It was not easy for a Rooster, who needs his flock. Fortunately, I was eventually offered a large studio at the Westport Arts Center, where thirty other artists, sculptors, painters, illustrators and writers have their own working space in an old converted school building. That was the perfect solution for me because I could be alone when I wanted -- or I could visit another artist, if I needed a break or to see another human face. Here at the Arts Center I developed a deep friendship with two other well known artists. One day, just for fun and our own amusement, we began to paint together on a large canvas. The work of three artists with three different styles and imaginations combined in one painting was startling. It was the beginning of a wonderful experiment. We called ourselves “The Gauguin Coalition” in recognition of the famous master whom all three of us revered most dearly. Our paintings were extremely well received in the various shows in which we entered them. But I was far more taken by the great joy the three of us had just by working together as a team. Somebody once said, that everything can be achieved as long as nobody cares who gets the credit. How true this sentence is! One of my other favorite distractions from work are my lecture tours. Here I meet librarians, teachers and most of all kids -- not only in America, but also in Asia, Europe and Africa, or wherever else my publisher sends me. As strenuous and exhausting as these trips usually are, they are also stimulating and gratifying. I only regret that I cannot visit more than a small number of schools every year, because I really want children to have the opportunity to meet a live author and share my fun and enthusiasm for books. In these lectures I try to give an honest account of the daily work and the ups and downs of my life as an author and illustrator: As a born Rooster I’m naturally up at the crack of dawn. I love early mornings! They are full of energy and mystery. What will the day bring, what will it show me, what can I learn and what can I heal? I start each morning with meditation to open myself up to the Source from whence I came and from which I have received everything in my life. The ideas for my books come from that Source, though they may seem to come via a story I heard; an incident in my life; a dream I dreamed; an adventure I remembered or simply through my imagination! Once I have an interesting story idea in my head, I go over it again and again until the story has become a part of me. I usually do this on long walks on the beach or in the woods where I am surrounded and supported by the creative forces of nature. In my mind I become every character in the story. I find out how they act, are they fat or thin, how they speak, how they eat, how they walk and so on. Once I have the story well constructed in my head, I return to the studio and write and sketch it out. Like on a story-board, I add one picture to another. This helps me to see if the story “flows” visually as well as text wise. I try to be as free as possible. If I get too crazy, I can always take it out later. At this point pencil sketches frequently get changed around, new ones added and text revised. And only too often it all gets thrown away to start all over again. It is the most exciting part of the creative process, as new ideas continuously bubble up, which may enrich the story or give it a totally new and unexpected direction. During the entire period I have to become each character myself again. I try to think, act and move like a bear, feel like a bunny or flutter like a bird. I try to put myself into their feelings, I explore their body movements, I think of the seasons. Is it winter? Summer? What time of the day? Will the wind blow? Or will it snow? And so forth. I have to find answers to all these questions and many more and may incorporate them in my drawings or my text. It is also very important to me that the story be highly entertaining and full of surprises. I like to be surprised myself -- and so do my readers. I am not afraid to break the reality barrier, as I fully agree with Maurice Sendak who reminds us that a picture book or a longer story is useless unless it has a fantasy element. Once I am more or less satisfied with these preliminary sketches I make what is generally called in the publishing world a “dummy”. Now the drawings have to be done in the size that the finished book will eventually be, however, they are still in pencil. As there are only a limited number of pages in a typical picture book, I must decide which motifs to choose for the final book. I have to give careful consideration to the layout of each page and have to leave sufficient space for the text. In my drawings I like to concentrate on the essence, the soul, of each character and often strip it of any unnecessary details. But depending on the project the background may have to be relatively accurate. This might call for some deeper research, and this is where my local library or my own picture reference library comes in handy. But sometimes I take my sketch block and go right on location to capture the correct environment. When all the pencil drawings are done, I bind the pages together and now, for the first time, the story looks like a real book. Now I check again to see if the story really “flows” or if it is rough and uneven. Does each page keep my interest? Do I want to turn the page to find out what happens next? Is everything well paced and does it all come to a good, logical -- yet surprising -- conclusion? Only when I am very sure that I have done my very best do I take this “dummy” and show it to my editor. I enjoy working together with all my editors and art directors because I’m a sucker for team work. I welcome their advice, help and suggestions -- although I do not always agree with them. But their sincere interest in the project helps me to explore alternative ideas and sometimes forces me to go deeper into the story than I had before. I am very grateful for all the guidance my editors have given me throughout the years -- and their confidence in me. My English is still not as good as I would liked it to be and my German is no longer as fluent as it once was! Therefore, when it comes to the written word I would be totally lost without the assistance of my wonderful editors, like Eva Moore, Sheila Barry, Grace Maccarone, Marilyn Moore, Ursula Heckel, Alan Benjamin and many more! I would like to point out that not every new book idea that I proudly present to my editors receives a standing ovation or even a gentle nod of approval! No, quite to the contrary. Although I have now published well over a hundred different titles in countries all over the world, I must have made at least another l00 “dummies” that were rejected and never made into real books. Rejections are just part of life -- particularly in publishing! However, when my editor has accepted my “dummy” and is satisfied with all the revisions, I begin to create the finished colored artwork for each page. My favorite medium is watercolor, which I often mix with pen and pencil. Watercolor has a very sensitive texture of its own. It gives life and dimension to the characters. I like my pictures airy, light and not overdrawn. For me it is important to say the most with the least. The viewer must be given the chance to fill in the rest and thus, get involved in the picture. I take great care with all the characters I draw. They must “speak” to me. Every movement, the turn of the head, the expression of the eyes, etc. are all carefully planned. But in spite of all this shaping and arranging, the most important thing I try to put into these characters is something I cannot describe in words. Maybe you might call it “soul.” It is something that brings them to life -- something that makes the viewer react to the characters -- not through the intellect level but more through the heart! Covers are always one of the most difficult challenges with every book. The cover has to encapsulate the essence of the story and it also has to grab the attention of a potential buyer. I usually have to make several different designs before everybody is happy. Together with my editor and the art director we choose the typeface as well as the placing of the texts. Then the material can finally go to the color separator and then to the printer. Many proofs and checks are involved before everything looks perfect and the entire book can be printed, bound and shipped to the bookshops, schools or libraries. From the first idea to the finished book can easily take two to three years. Therefore, I often work on several books at the same time. Even when I travel, I write and sketch out new ideas. There may by some frustrations and challenges when it comes to revisions, changes and deadlines. But I can’t think of any other profession I would rather be in. Making books and plotting scripts for my many TV shows is for me a boundless source of joy. I hope that I can pass on some of this enthusiasm on to others through my work. Young children are often much closer to the wonders and truths of life. It’s sad that when we get older, we seem to lose this sense and get far too involved in worldly affairs. We forget about the mineral, plant, and animal kingdoms around us. We stop believing in elves, witches, gnomes, dragons and all the nature beings. Our inner ears and eyes become closed and we only listen to outer noise and its distractions. Therefore, I don’t just make books for young children. I make books for everyone who likes to hear or read a good story. We all carry in us that “inner child” who wants to believe in truth, honesty, values and a good ending. This inner child is still living, even in those who try to act cool and avoid showing any emotions. Deep down this inner child craves nourishment, warmth and a sense of security. And through all ages and cultures no tool has satisfied these needs more than the telling of a story. I regard all the ancient fairy tales -- and lots of new ones -- as food for our souls. Stories are like mirrors in which we can discover ourselves -- our tragedy and our comedy. We learn to accept our own imperfections and the imperfections of others. Through the images and metaphors of stories we are reaching into the spiritual realm of our existence. The stories are the key to our deep longing for what I call Home, which is not necessarily a place, but a feeling of ultimate peace and harmony! And it may be different for each one of us. But through stories we can find this Home at any time and any place. For this reason the great spiritual teachers of every age have always been storytellers. And to remind us of our Home we keep retelling, over and over again, the stories of those teachers. Isn’t it funny? There I’ve been -- searching all my life for a permanent place I could call home, first in South Africa and then in many countries around the world -- only to realize that all the time I’ve been carrying my real HOME within me. What strange creatures human beings are! Seventeen years have passed since I wrote the above notes about my life up to the year 1990. After having read it again, I am happy to say that still I agree with virtually all that I wrote at the time. Since then my life has been a continuation of rich and mostly beautiful moments. As an author and illustrator of predominately children’s books, it has always been my joy and ambition to create and send out wonderful books into the world. In return I seem to have received many wonderful blessings over the years. One of such blessings--in disguise--was the unexpected sudden closure of the Westport Arts Center where I had my studio for many years. Because of the unexpected increase of young children in the area, the building had to be converted back into an elementary school. Initially we artists were very upset having to give up our beloved center. However, I was very fortunate to find a new large studio space only a few miles from my home. It didn’t take long for me to totally fall in love with this new studio, and also with the beautiful landlady who soon became my wife and best friend. Judy Henderson is a well-known artist and her ceramics, paintings, and furniture are in collections all over the world. (www.judyhenderson.com). We are both fortunate in being artists who deeply love and respect each other’s work and we often seek out each other’s artistic feedback and suggestion. I am still surprised how easily I adjusted to married life. I guess, when one finally meets the right partner, one’s life just becomes a whole notch better. In my case it became even three notches better because Judy had two magnificent daughters who warmly welcomed me into their circle. As I write these words, they have now grown up and left our home to follow their own careers. Margot is an accomplished oenologist in California and Sarah is following her dream by completing her studies in photography. We now live in a 200-year-old New England farmhouse in Weston, Connecticut, where the former horse stables and barns have been totally remodeled and serve as our studios. 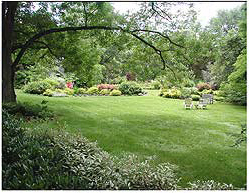 The buildings are nestled in a beautiful garden with many flowerbeds, shrubs, and bushes that I have planted over the years. Some magnificent, rare old trees stretch their long branches over green lawns. Lots of pretty yellow dandelions are sprinkled all over the lawns to maintain the farm character and country charm. Gardening is my favorite hobby. I must have inherited it from my grandmother who always had lots of flowers--in particular roses--around the house and a large vegetable garden in the back. Winters are for me the most trying times here in Connecticut. During these months I deeply miss the warmth of the sunshine that I so easily got used to in Africa. I long for the colors of flowers and trees. To help me through this dreary period, I have added huge steel sculptures of rambunctious mythological figures that dance and frolic through our garden the whole year round. And they are all in bright colors so that I will always discover something cheerful when I look out into the garden on gray winter days. Talking of big sculptures, I must not forget to mention Jolantha. She has become the most famous pig in Connecticut. Jolantha’s story goes back some 100 years when the love of two young people was saved by her heroic act in the very stables that are now our studios. You can read all about it on her own Web site: www.Jolantha.com. I felt so touched by her story that I decided to immortalize her with a big cement sculpture that now guards the driveway to our studios. She has become a symbol of Love, Life and Celebration and gets dressed up for all the seasons and holidays of the year. Some of her outfits have made her into a real traffic-stopper--which Jolantha thoroughly enjoys. All she wants to do is spreading a little joy and happiness. I totally share Jolantha’s motivation with my books, lectures and workshops. Some people are surprised when they hear that I have published well over two hundred books that are translated into twenty languages. But when you love what you are doing and do what you love you never have to work a single day in your life. It all becomes an expression of joy. And then, one day, you turn around and see that you have filled a whole bookshelf of magical stories. I find this is very exciting because I know that there are so many more beautiful stories waiting to be written and illustrated. Over the years the children’s book market has changed a lot. Many publishers are facing high cost for inventory and are no longer able to keep books in print indefinitely. Books are getting out of print faster and faster. It is my guess that maybe half of the books that I have written and illustrated over the past twenty-seven years are now out of print. Classics like Tyrone the Horrible have become “extinct” and can only be found in rare books stores. But Tyrone is not the only one who is missed by his fans. There are other beloved characters that have touched millions of young readers and are no longer in print. Week after week I was getting e-mails from teachers and librarians, parents and children who kept asking me of how to obtain old copies of these books. I finally came up with a solution that is very bold and unusual for any author/illustrator who makes his living off royalties: Together with the help of the University of Connecticut I have created a Web site where every child, parent, teacher, and librarian can download and read all my out-of-print books for free! Furthermore, I have added all those books that I have specially created for my European and Asian publishers--in their original language as well as in English. Once they are all translated the site will feature over 100 titles. The name of the site is: www.ChildrensBooksForever.com. This site is my special thanks to all the wonderful teachers, librarians and parents who have shared my books for so many years. They can not only download and print out these books for free but also use them on their SmartBoards, PowerPoint, computers and overhead projectors and share them with the entire class. I am deeply grateful that so many of my book titles are offered via book clubs where the students pick the books themselves. When creating a book or a book cover especially for the book club, I do not have to consider the parents or grandparents who usually buy the books for the child in a store. I communicate directly with the young readers with my stories, words, and images and over the years they have picked my books over twenty-five million times when placing their book-club orders. I am deeply grateful that Scholastic is selecting so many of my books for their book clubs. In my earlier autobiography I mentioned my deep interest in the spiritual aspect of life. For the past forty years I have been studying, writing, and finally teaching at the local college the universal laws on the mastery of life. All these years I had kept a journal in which I collected insights, quotes, exercises, and observations that gave me a deeper understanding of these laws. With time they have become powerful tools that have guided me and reminded me whenever my own world seemed to turn upside down. I never intended to have this personal journal published, but when my editor heard about it she made a strong case for having this collection shared with others. This is how The Book of Courage was born. I illustrated every page with bright and energetic images that compliment the words. It is not a book for very young children but it soon became a favorite for anyone interested in spiritual truths that transcend religious beliefs. The book received many wonderful reviews. Since the publication of the book I had the great pleasure of being invited to teach at colleges and many organizations that are open to the positive and life-affirming wisdom of these universal laws. I have started my autobiography with the detailed description of my birth. Therefore, it is only appropriate that I finish this update with details on my future demise. Because I still have so many things to do and books to write I plan to leave this world at the ripe old age of 127 years. Should I be taken before that age I will merely be surprised and amused. The only thing I want to have written on my gravestone is my life’s motto: “He has seen it all and he has loved it all”. © 2018 Hans Wilhelm, Inc.